Alkane fuel is a key ingredient in combustible material such as gasoline, airplane fuel, oil — even a homemade bomb. Yet it’s difficult to detect and there are no portable scanners available that can sniff out the odorless and colorless vapor. But University of Utah engineers have developed a new type of fiber material for a handheld scanner that can detect small traces of alkane fuel vapor, a valuable advancement that could be an early-warning signal for leaks in an oil pipeline, an airliner, or for locating a terrorist’s explosive. Their discovery was published online Friday, March 25, in the American Chemical Society’s journal, ACS Sensors. The team is led by University of Utah materials science and engineering professor Ling Zang, who also is a faculty member with the Utah Science, Technology and Research (USTAR) economic development initiative. Currently, there are no small, portable chemical sensors to detect alkane fuel vapor because it is not chemically reactive. The conventional way to detect it is with a large oven-sized instrument in a lab. So Zang’s team developed a type of fiber composite that involves two nanofibers transferring electrons from one to the other. PHOTO CREDIT: Dan Hixson/University of Utah College of Engineering. 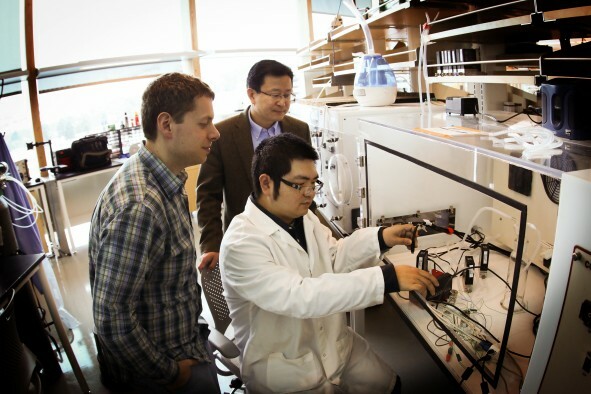 Ben Bunes (left), Ling Zang and Chen Wang (in lab coat), all researchers from the University of Utah’s material sciences and engineering department, demonstrate a new prototype detector that can sense explosive materials and toxic gases. The research team developed a new material for the detector that can sense alkane fuel, a key ingredient in such combustibles as gasoline, airplane fuel and homemade bombs. That kind of interaction would then signal the detector that the alkane vapor is present. Vaporsens, a University of Utah spinoff company, has designed a prototype of the handheld detector with an array of 16 sensor materials that will be able to identify a broad range of chemicals including explosives. This new composite material will be incorporated into the sensor array to include the detection of alkanes. Vaporsens plans to introduce the device on the market in about a year and a half, says Zang, who is the company’s chief science officer. Oil pipelines. If leaks from pipelines are not detected early enough, the resulting leaked oil could contaminate the local environment and water sources. Typically, only large leaks in pipelines can be detected if there is a drop in pressure. Zang’s portable sensor — when placed along the pipeline — could detect much smaller leaks before they become bigger. Airplane fuel tanks. Fuel for aircraft is stored in removable “bladders” made of flexible fabric. The only way a leak can be detected is by seeing the dyed fuel seeping from the plane and then removing the bladder to inspect it. Zang’s sensors could be placed around the bladder to warn a pilot if a leak is occurring in real time and where it is located. Security. The scanner will be designed to locate the presence of explosives such as bombs at airports or in other buildings. Many explosives, such as the bomb used in the Oklahoma City bombing in 1995, use fuel oils like diesel as one of its major components. These fuel oils are forms of alkane. The research was funded by the Department of Homeland Security, National Science Foundation and NASA. The lead author of the paper is University of Utah materials science and engineering doctoral student Chen Wang, and Bunes is the co-author. PHOTO CREDIT: Dan Hixson/University of Utah College of Engineering. University of Utah materials science and engineering professor Ling Zang holds up a prototype handheld detector his company is producing that can sense explosive materials and toxic gases. His research team developed a new material for the detector that can sense alkane fuel, a key ingredient in such combustibles as gasoline, airplane fuel and homemade bombs.